There’s no "Christmas creep" here at redemptorists.net! We hope you’ll join us again this year beginning November 23 for our annual Advent retreat. Each Wednesday we’ll post a new reflection on the coming Sunday’s Gospel reading. Our meditations this year are written by our four newly professed Redemptorists! 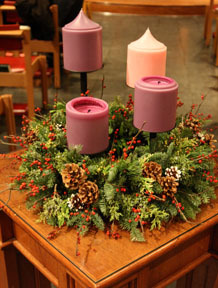 Also during Advent, check in with us on Mondays for short video stories from several Redemptorists. Meet some of our confreres, hear their vocation stories and tales from their missions, and listen to them tell you, in their own words, how God has blessed them in their vocation.